Social media has become a huge part of our culture. From staying in touch with friends to reading information on products and people, there are many reasons why Facebook and Twitter have become a big part of our lives. But can they help businesses flourish? 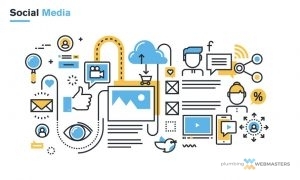 Here is why social media is important for your plumbing business. Social Media Services Can Help You Stay Connected and Meet New Customers. Since social media is a great way to stay connected to friends and family, it’s also a great way to stay or make new connections with customers. Building relationships are important in businesses and social media is an easy way to build long-lasting customer relationships. Using Facebook, Twitter, and Instagram is great way to reach out to new customers. By using tools like hashtags or even linking to other content can help gain your visibility for new customers. In addition to blog posts that create new content and put your name out there, using media strategies can actually increase your brand awareness, making it easier for people to find out who you are and keep you in mind when they need your services. SEO is great when people are searching for your particular service on Google or another search engine. While having unique content and the right keywords is important, having more presence on the web can help find you more readily and boost your rankings in search engines. If you need social media services for you plumbing website, call the Plumbing Webmasters at (877) 388-9884 for quality services that you can depend on.